The last few years have been very difficult for Greece. The economic situation is dire and ordinary Greeks struggle everyday to get by. The anxiety and uncertainty has to be crushing. From the outside, we can only guess. Even from the inside, as visitors, it’s not obvious. Recently, our illustrious leader, Ronen Paldi, visited our friends and colleagues in Greece, and he found the streets, squares and tavernas alive with Greeks. They are not, after all, staying under the covers all day lamenting their hard lot. Greek character has weathered some pretty wretched chapters in 3,000+ years, some of the worst in just the last century. They won’t be beat by this latest test. Visitors are welcomed with the same exuberance as always, only now, perhaps, appreciated more than ever. Now that we have established that it’s a great time to visit Greece, we’ll tell you about some of the things you’ll see there. Greece is a large country with layer upon layer of sites and experiences. In this post, we’ll look at the top attractions in Athens. It probably goes without saying but we’ll say it anyway. When in Athens, visit the Acropolis. You can’t miss it and you shouldn’t. It can be seen from all over the city (acropolis means high place, roughly) and it’s pretty special seen from afar, especially when illuminated at night, but take a couple of hours to go up top and see the buildings up close. The most famous and most prominent building on the Acropolis is the Parthenon, which still inspires architects today. The embodiment of harmony and balance, the Parthenon symbolizes the ideals of Classical Greek culture. Syntagma Square (Constitution Square) commemorates the writing of Greece’s constitution in 1843. The wide-open square stretches out in front of the grand, if somewhat severe, Neoclassical Greek Parliament building. This is a good spot to rest your feet and people watch. 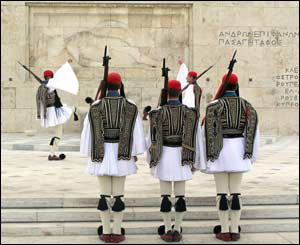 Stick around long enough to see the changing of the Presidential Guard (Evzones) at the Tomb of the Unknown Soldier, which happens every hour on the hour. The Evzones’ historical uniforms are rather silly but beautiful, involving pleated skirts and pom poms, and their duty is solemn and moving to watch. At 11:00 on Sunday mornings, the changing of the guard is a full-on military parade, with a band and over 100 Evzones in full dress uniform. This is a real spectacle and worth scheduling around, if you like that sort of thing. Behind the Parliament, the shady trails and benches of the National Garden feel worlds away from the intense city. After chilling in the peaceful National Garden, dive back into sensory overload at the Plaka and Monastiraki, adjacent neighborhoods winding around the base of the Acropolis, both jam-packed with shops and restaurants. Monastiraki has a flea market on Sundays that attracts more locals. If Athens is the cradle of Western Civilization, the Agora is its pillow (or mattress?) It was the political, social and cultural heart of the ancient city, where the idea of democracy was refined, where Socrates challenged young minds, where the first theatrical dramas were performed… There are some beautifully restored Classical buildings here. There’s so much to know about the Agora and the Acropolis, we recommend using a guide for these sites. This entry was posted in Greece and tagged Acropolis, Athen, Greece, Greek, Monastiraki, Parthenon, Sunday, Syntagma Square by yalla2013. Bookmark the permalink. Thank you for some other magnificent article. Where else may just anyone get that kind of information in such an ideal method of writing? Thanks for your kind comments Enrique! For more information, you might try the website of the Greek tourism office http://www.visitgreece.gr/.